A wonderful gift shop of wine accessories and unique gifts are available – and what better way to shop than with wine glass in hand. Afterwards relax on the front porch in the rocking chairs, have another glass of wine, and enjoy the beauty of the vineyard. If you enjoy great music, food, wine and good times then check the details on upcoming activities. There are festivals almost every month. The entrance road leading to the tasting room and gift shop winds past vineyard #1, an old tobacco barn, and the duck pond. Families and tour groups are welcome, and picnic areas are available for our customers. The vineyard is part of a former tobacco plantation that has been owned by the Bellamy family since the 1800′s. 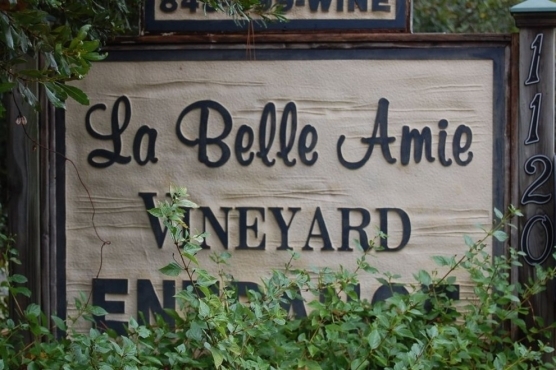 La Belle Amie, meaning “the beautiful friend,” is the European origin of the family name.